Christmas Light Up. 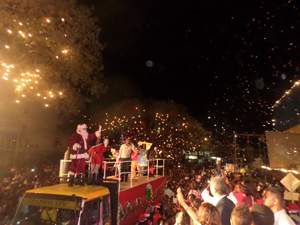 The ceremony beckoned the season with joyous children as well as the anticipated arrival of Santa Claus and his helpers. The event was chaired by Simon Harris and Nurriyih Gerard, who managed to entertain hundreds of eager observers. The event started out with an acrobatic dance performance from the Classique Dance Company. The crowd enthusiastically joined in singing contemporary renditions of classic Christmas songs like “Little Drummer Boy”, “Here Comes Santa Claus” and “Do You Hear What I Hear” along with others. Among the singers were winners of the Guyana Telephone and Telegraph (GT&T)’s Competition Ryan Hoppie and Timeka Marshall, along with 2011 runner up Esther Osborne, who were all met with a tremendous fanfare from the crowd. Following these phenomenal singers, was another creative dance piece by the little ladies of the National School of Dance. The girls left observers mesmerized as they displayed their skills in stunning Christmas themed outfits. The night continued with the up and coming, all brothers band, Y3K which also energized the crowd with a performance of an original Christmas song, which they wrote and produced. Managing Director of Courts, Clyde de Haas also took the time to present a two million dollar cheque to the winner of one of the company’s Christmas promotions. The winner, Latchmin Singh, was overcome with delight. She encouraged attendees to shop at Courts as they may one day become a millionaire too. As the night continued, crowds were “laughing loud” with the comedian ‘Radika’, as they eagerly awaited the arrival of Santa Claus. The Christmas Patron made his initial appearance in a dance off with his “twin brother”. First Lady Deolatchmee Ramotar joined in the celebrations as well, reminding Guyanese that Christmas is a celebration that unites all. Minister of Education Priya Manichand flipped the ceremonial switch which illuminated Main Street.